Modern architecture fans might agree that the Baha’i Temple is one of New Delhi’s most impressive buildings. 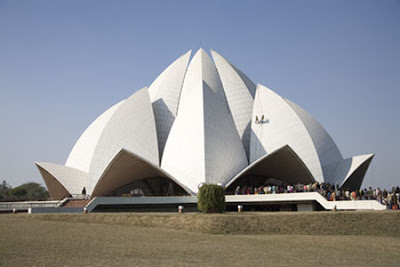 Commonly referred to as the Lotus Temple the shape of the massive building is based on the flower. It is one of the most visited sites in New Delhi. Completed in 1986 the temple, which is surrounded by nine reflecting pools, sits on more than 25 acres of peaceful, impeccably landscaped lawns. The interior features clean open space, high ceilings and curved rows of seats. As with all temples be prepared to remove your shoes before entering. The cool marble floors are soothing underneath tired feet. The Lotus Temple is open Tuesday-Sunday from 9 a.m. and closes around sunset. There is no admission charge. If you look closely at the photograph you can see two men scaling the temple to clean the exterior. Have you also seen Akshar Dham in Delhi ? It's another newly built place to see, especially in nights. 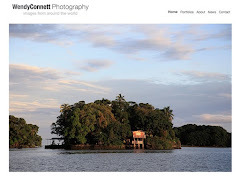 Of course there are many historical places as well. My husband is from Delhi so when we go to visit family we always take in a few sites. There is much to see in Delhi.